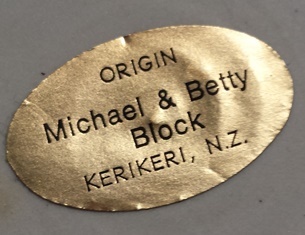 For the gallery: Here is a mark and sticker for Michael and Betty Block who also called themselves Origin by the look of this sticker. Thanks to Whangarei's Habitat for Humanity shop. 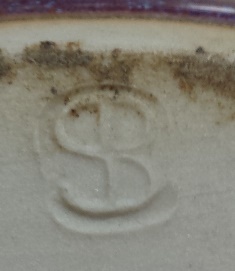 And here are a couple of unknowns... at least not known to me, but I find studio pottery pretty mysterious! 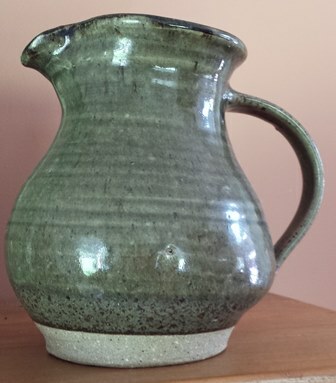 Nice jug, flat dry base tho. These are in my friend Lois's kitchen. And this one.. with a very odd complex mark, a slightly dodgy photo taken on my phone in low light. Lastly Greg Barron. Yay that's one I KNOW! Oh my, that first red and blue pot doesn't look like the Block's work or mark. Kat posted this mark the other day and we discussed it. I will have to find it now. I wonder if that sticker fell off something else .....? Maybe the Blocks had a shop and the sticker relates to that? I've added the Michael and Betty Block sticker to the Gallery thanks Val, as we may not see another. 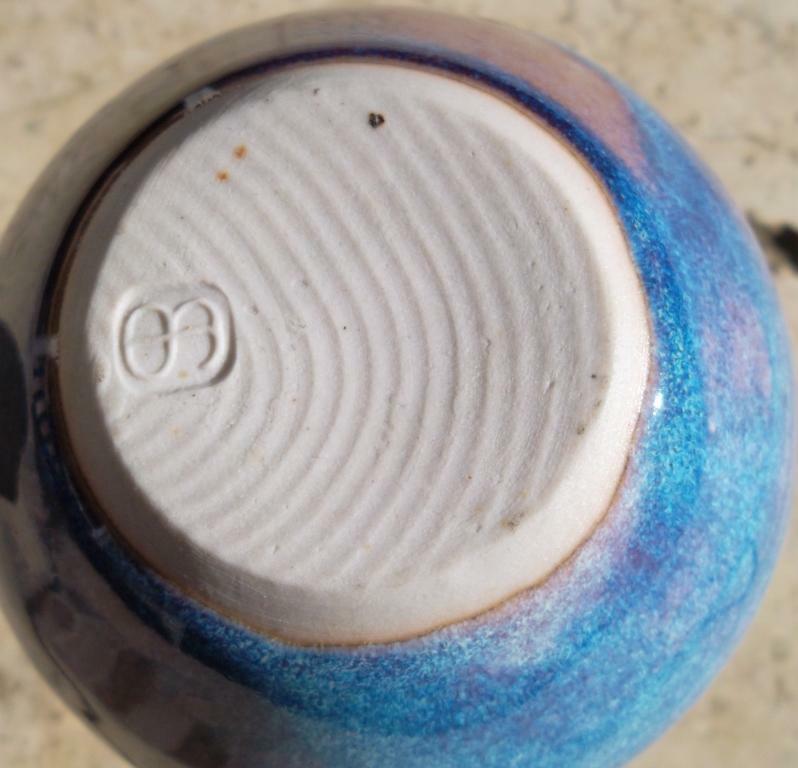 There is a slight difference in the marks, where the B comes together in the middle is different on each mark maybe theyare both correct theres lots of Michael Block pottery around up here Im sure this blue is correct for him too. Gosh and then there is that Bill Schiessel mark that looks the same! I've seen many marks from the Blocks, but never one like this Kat, though I have seen red and blue glazing at times. We will have to keep this on the burner for now. I will put both marks together and check them out. 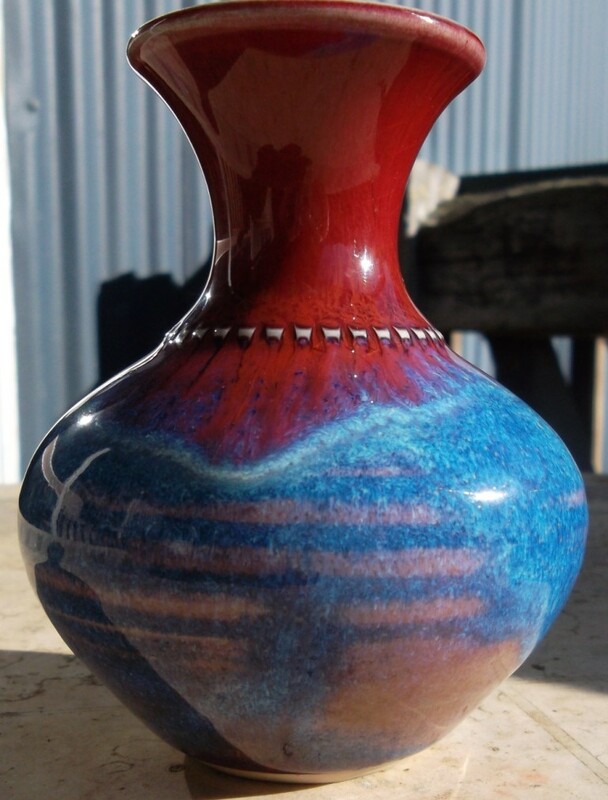 Suzanne is famous for her red and blue glazing. Suzanne's on the left ... Val's on the right. Pls ask if Michael & Betty Block are her parents? she says they are a Michael & Betty Bloch-Jorgenson full time Potting from KeriKeri.. then it would make sense! Block maybe a shortened name. Wow I think you nailed it Kat !!!! I didn't even read her blurb and when you do it all makes sense. Though I think this will be her mark and maybe Val is right in thinking that Origin is the name of their shop. Fantastic history that I had no idea about. Wow thanks Tony as that is very insightful. Great ta Tony - that does make sense of the sticker doesn't it? I have just emailed my pic and question, will let you know when/if I get a reply. I have had a lovely prompt response from Suzanne Bloch-Jorgensen, see below. 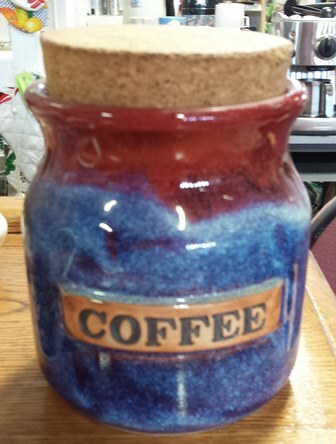 I definitely did make the coffee jar, several years ago. Michael & Betty Block are my parents and both were full time potters. Dad sadly passed away two and a half years ago. They belonged to Origin craft co-operative in KeriKeri. 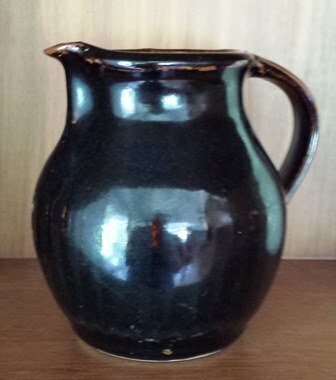 I also sold some of my pottery through Origin. Origin co-op was a successful business for over 30 years and closed about two years ago. Mum and Dads surname is Bloch-Jorgensen but Dad thought it would be much easier to shorten it to Block. I have been potting full time for over 35 years. I have my studio in Oakura, New Plymouth. I am curious to know a bit about Bill Schiessel. 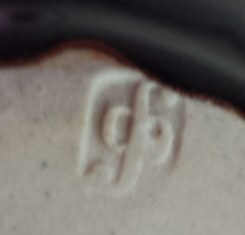 I see in the Potters Mark book he has a stamp very similar to mine. 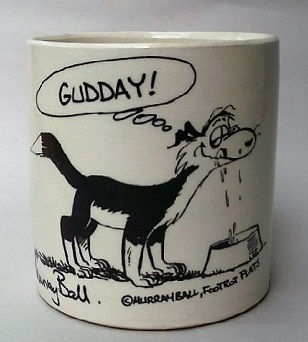 I have been annoyed to see people selling my pottery on Trade Me stating that the pot has been made by Bill Schiessel. My friend who is a Trade Me member has contacted sellers to let them know the pot they are selling is made by Suzanne Bloch-Jorgensen but the sellers just ignore it. I have used my stamp for over 35 years. 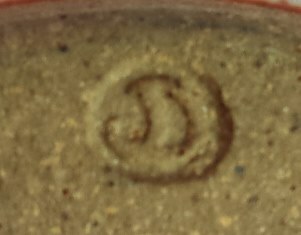 Is the picture of the stamp you have sent me taken from the base of the coffee jar? In the discussion the picture of the stamp on the left is definitely my stamp. It has been interesting for me to read the discussion. Hope this all helps. 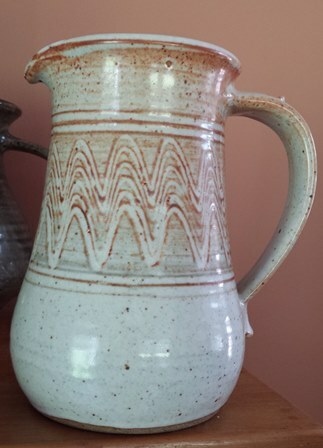 I think this glaze is absolutely beautiful - the way it catches the light is quite stunning. 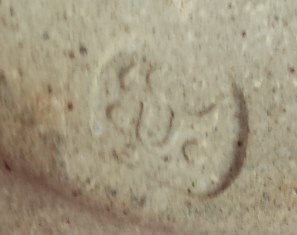 The pattern around the neck of the vase is raised.